Mr Cage was charged with domestic abuse, disturbing the peace and public drunkenness. He and his wife Alice Kim were arguing outside a house in the French Quarter that the 47-year-old star said they were renting, a police statement said. Ms Kim said it was not theirs and the Oscar winner grabbed her arm and started hitting cars, it added. He then shouted at a police officer who had seen his behaviour. After being taken to Orleans Parish Prison he was released on bail and ordered to appear in court on 31 May. 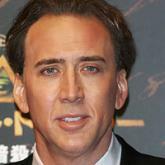 Mr Cage won the 1995 best actor Oscar for Leaving Las Vegas, in which he played an alcoholic with a death wish. Reports say the actor once owned a house in New Orleans and has previously shot films in the city.